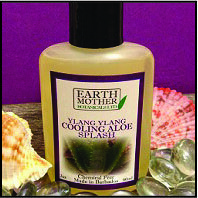 Aloe & Ylang Ylang Splash | Earth Mother Botanicals Ltd.
Hydrating toner with healing aloe is excellent for dry or sensitive skin. Refrigerate this toner and use on sunburned skin or burns for soothing, cooling and healing. It removes the heat and helps burns heal with less blistering.